Do you want to know what my weakness is at the grocery store? It's not the ice cream or sweet pastry treats its the stack of magazines at the check out line that lure me to indulge! They get me every time! So when I chose the longest line possible just to have more time to peruse I was reminded of Renovation Style and immediately threw it in my cart! As soon as I arrived home I jumped on their website and found this sweet albeit very small condo in MN! It was such a cheery space and a great example how to maximize a smaller floorplan I knew I had to share it with you all! 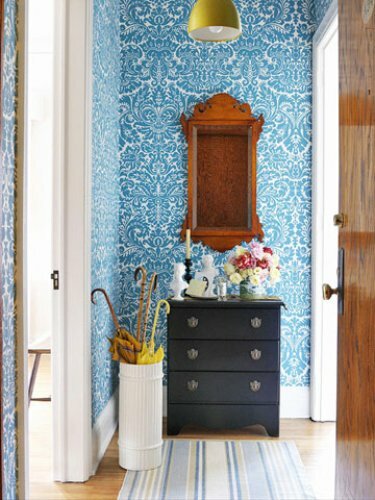 The bright patterned wallpaper adds such happiness to a narrow hallway. I like how they chose a black piece of furniture and wood finished mirror it's a great way to ground the space! 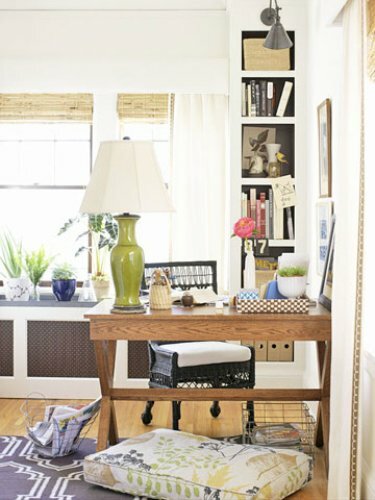 My favorite small space furniture is nesting tables and they are used perfectly here! Look at that ottoman, such sweet legs! Though I might be on the hunt to replicate the chair fabric, it's fantastic! Check out the homeowners use of the window ledge. Every inch is maximized in this room. Instead of installing recessed lighting the owner gets creative with lighting above each built in bookcase! 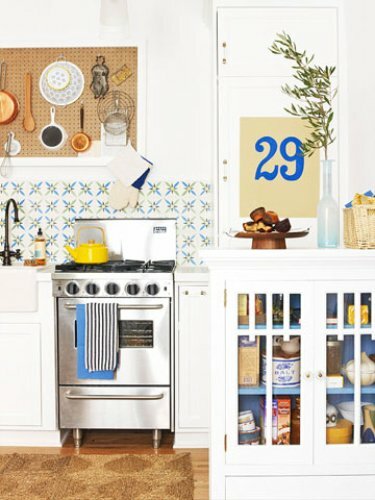 The kitchen is perfectly chipper with it's white and blue scheme. Pop over to the website for before photos and how by just raising the cabinets a bit, created the feeling of a larger area! This rug is FABULOUS!! I love how it works perfectly with the chair fabric in the living room. 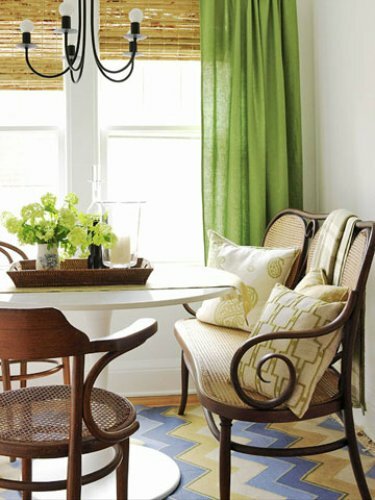 The bench is a wonderful addition to this nook as it creates more interest than just adding another 2 chairs! Did you spot the chandelier and how it is updated with a few round bulbs? I like that look! So what do you say, could you live in this small space? love the top picture - love the wallpaper! I most definitely could live in this space! I love it! I think the dining room is my fav! Thanks for sharing! 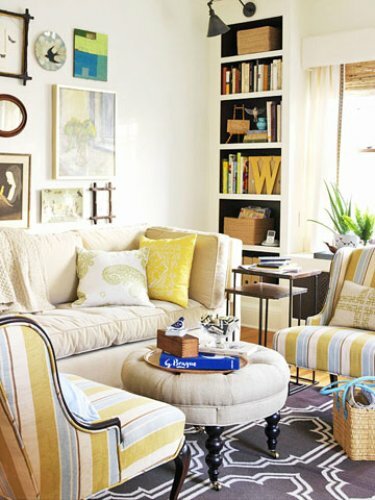 This space doesn't look small at all--looks so bright and airy! Love the colours. Great use of space! The magazines get me every time too!!! My mood has improved already. Absolutely beautiful. i love that little kitchen. the stove seems so tiny! it's so cute! YAY so happy to hear you are all in love with this space too! Marsha so glad it brightened your day! great post! I totally agree and i love these images!! 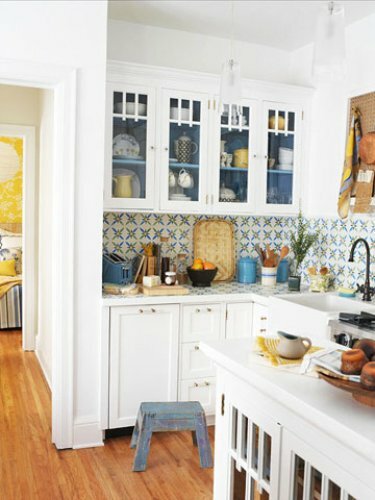 So loving this entire home--I remember it from when it came out and loved seeing it again to focus more on the details. Worth studying for color, style, and space solutions. Thanks for sharing! Love the living room and the last photo. Great designing. Lovely interior shots of this place. So great to live in there. The colors so perfect too.